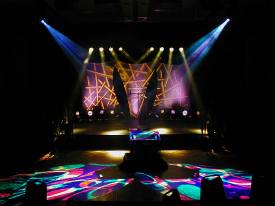 Services include sound systems (of all sizes and capabilities), stage lighting as well as special effects & custom lighting, multimedia presentations, custom staging and podiums, microphones (assorted styles), video screens and projectors, LCD/Plasma flat panel displays, simultaneous translation services - and more. 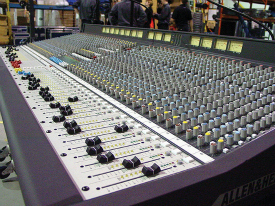 Having extensive hands-on experience in both the music as well as show businesses means we know our way around a mixing console, lighting trusses and the right power requirements. We also realize that different types of presentations whether they be musical stage shows, language-intensive entertainers (comedians, hypnotists, etc.) as well as motivational speakers, bands, etc. 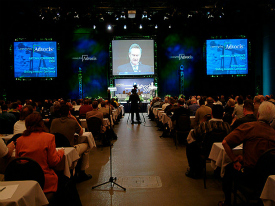 require different audio visual solutions. Our on-site technical personnel are highly experienced event professionals who provide friendly, courteous and rock-solid reliable services for any type of program. For a very competitive quote, contact us today.